What is a Good Cat? This is not intended to be the start of a pricing thread. 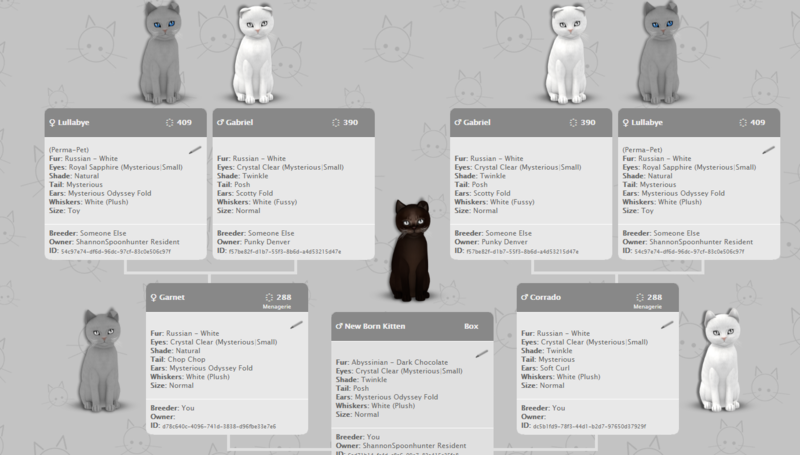 But it is intended to show what is the sort of cat that people spend months developing - cats that take well over 1000L to develop - over (kitty) generations of careful mixing of traits and attention to aesthetic detail - and also breeding games based on trait names that KittyCats and the community have developed over the years. Please note that putting in 1000 lindens does not mean that you will get 1000 lindens out. Breeders of highly-bred cats will tell you, it’s a labor of love. You put in way more lindens than you get out - but the cats are gorgeous. In the early days of KittyCats there weren’t as many traits available and the mechanisms of how to breed were just being discovered. In the early days, the pinnacle of breeding was the Quadruple Mysterious cat. You may have noticed that there are Mysterious ears, Mysterious tail, Mysterious whisker shape, and also the recessive eye shape is called “Mysterious”. Figuring out how to put all four traits on one cat showed that you understood what was going on. I regret that I do not have a picture of a Quadruple Mysterious to show you. In our current days, I know one breeder who has done up a Quadruple Dreamy. Lady Magick (MsMagick) has a line of cats that have Dreamy tail, Dreamy whiskers (and maybe some with DoubleDreamy? ), Dreamy Fold ears, and Sparkle or Crystal Dream eyes. In between the Quad Mysterious and the Quad Dreamy, KittyCats themselves introduced the Triple Tiger with their Menagerie Tiger line. 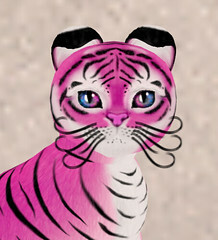 A Triple Tiger has Wild Tiger ears, a Tiger Curl tail, and your choice of 2 limited edition eyes that came out with the Menagerie Tigers: jade or blushquartz. These are often shown on bengal furs (for bonus points) but can be on any fur. With the introduction of the Tiger! 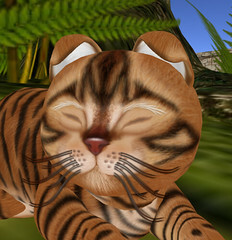 furs (based on the original Menagerie tiger furs) and the Tiger Fold ear, we now have an expanded range of Tiger cats. In the chat I have seen a number of people popping in to show off their Quadruple Tigers: Tiger! fur, Tiger Curl tail, one of the Tiger ears, and jade or blushquartz eyes. Mind you, once the form has been developed, it gets easier to reproduce it by buying somebody else’s. It used to be really hard to get a Triple Tiger. Not so much anymore. But developing one through breeding, in whole or in part, does help to teach you how to breed. Also the forms go together. It becomes apparent, if you spend any time looking at the cats, that Callie made certain traits to match each other. Look at how precisely the Chocolate-Tipped whiskers match the Burmilla Blue-Shaded fur. That didn’t happen by accident. 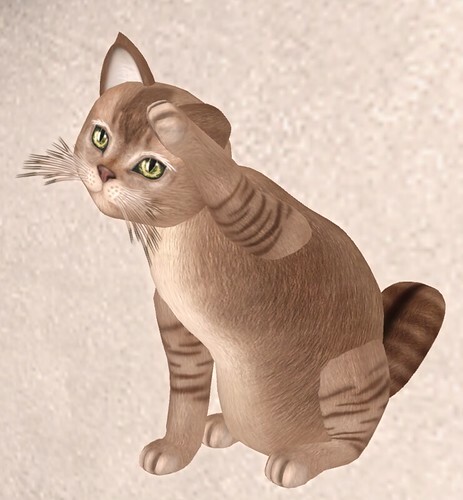 As you work with whiskers you will realize that the colors are Not the same on all shapes of whiskers: a Blonde-streaked Fussy whisker is Not the same color as the Blonde-streaked DoubleDreamy, which is not the same color as a Blonde-streaked Mysterious. Dark chocolate DoublePlush whiskers are burgundy shaded(!) but in DoubleSnappy they look more like a chocolate bar (with less prominent shading). Auctioneers routinely tout cats that are “Matchy”. They are worth more money. They are cats where when you look at them, you say “that cat is perfect just the way it is”. They come from breeders who know the traits well and have put in the breeding kibble to develop the cat. The traits all come out onto the grid in starters as 1T, 2T, or 3T etc. 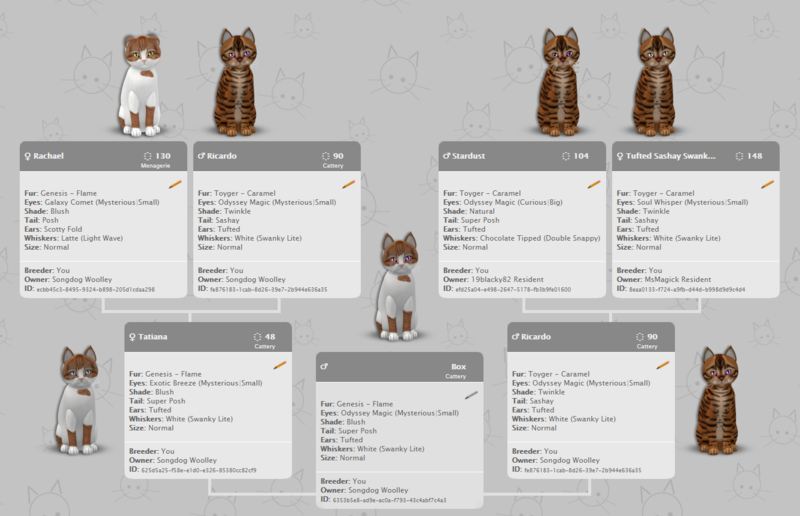 Sometimes Headquarters helps: a lot of Toyger Snows were released in starters alongside Cream whiskers, for example. Here’s a Bubblegum Tiger! with Serendipity Glow eyes. The pink on both is the same. That’s not an accident. Look at those whiskers! Those are Sassy whiskers in Butterscotch Tipped-black. The Sassy form highlights the tips at the end, and the tips perfectly match the rim in the Tapestry Royale eyes. Put it on the retired Burmese Sable fur and the combination sings. That took work. It took work even if Burmese Sable is dominant because it’s easy to lose a dominant trait. 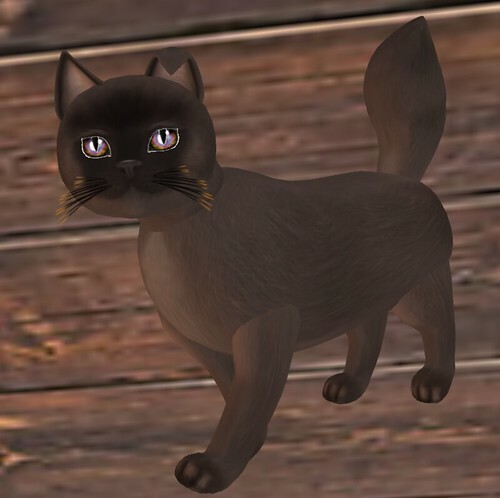 Sassy whiskers are mid-range; it’s hard to keep them on a cat line through the generations because so many whiskers are more dominant and will cover them up, and so much DoublePlush, DoubleDreamy, and indeed SwankyLite are lurking or showing on so many cats in the grid. Do not underestimate the mid-range traits. Many of them, like Sassy whiskers, are very nice indeed. As this thread goes forward, I would hope that people would post pictures of well-thought-out cats and why they look special. We have the Showroom section of the forum for people to post pictures of their own cats to promote them and so I ask that this thread not be used for sales. This is ultimately meant to be a Discussion thread with illustrations. What are the great cats you have seen? Also forms like Bastets (foxie ears, tiger curl on a russian black). Foxy Foxies. Amazing matchys. RE: What is a Good Cat? Your thoughts were so well thought out and demonstrated by examples. At times, I get so frustrated by many of us in search of a 9t cat and that is all that is said. I, personally, enjoy many genesis traits, but by your exemplifying traits that blend together and (why) they are preferred together, it helps us see the "complete" cat for the gorgeous animal it can be! For me, I enjoy making different combinations, which don't always give me a great pedigree background of solid kitties ... for things like proofs. But, ENJOY making different cats and am not about perfection. We all like what we like ... which is amazing! 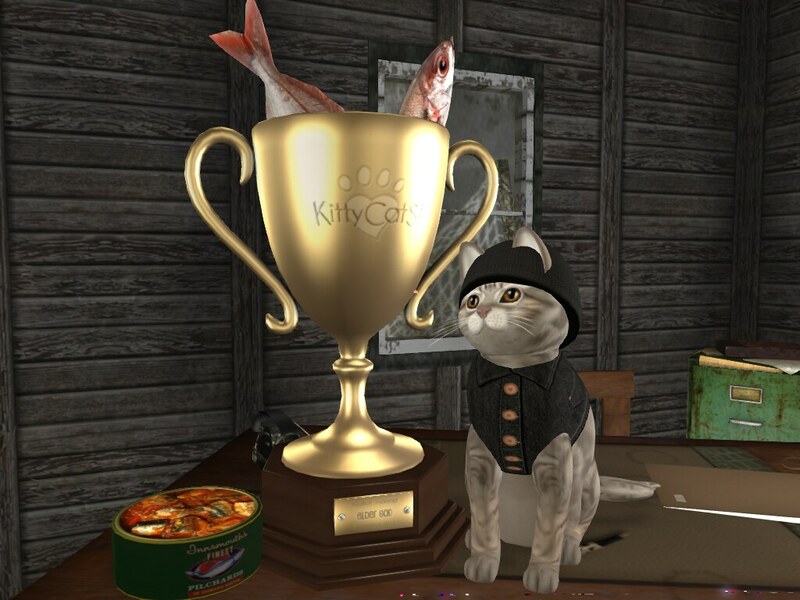 The many of you who love building pure cats and who deserve all the benefits of selling your creations, if that is what y'alls choose to do with them, have truly put in your time and "kibble" and well deserve the fruits of your labors. Especially, thank you for helping us see that a 9t is not a 9T, is not a 9T. Quality over quantity, if we seek a well-traited kitty that has many, if not all, the features we enjoy ... To each our own and 'viva la difference'. Thank you for blogging your experience with us. 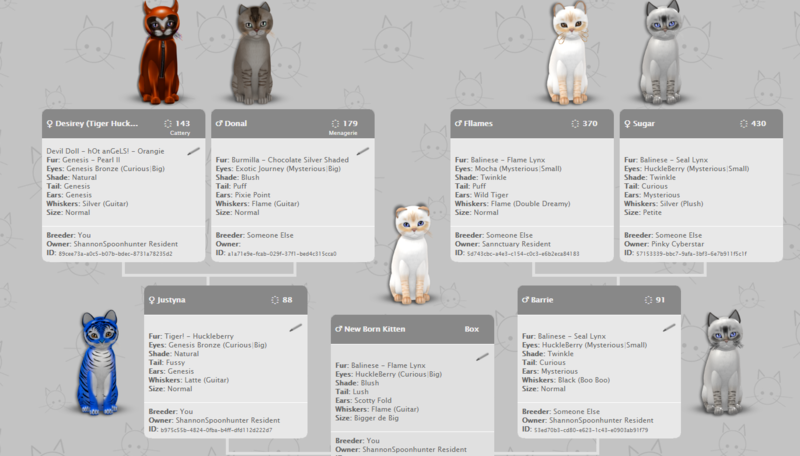 I do actually have Quadruple Mysterious cats, as well as Quadruple Curious that I personally found more desirable despite not being the coveted 9 traits. I'll birth some after work and post pictitures. Personally for me 9T is not the best cat, some eyes look better with Curious or Big as one or both traits and I love Natural Shade and often breed for it. Prior to Monochrome Whisker colour being released I would often breed for Silver to make a cat couture. I have always found that other breeders of couture cats apreciate this and it doesn't detract from value at auction. Here, I was trying to get huckleberry eyes on a Tiger! Huckleberry (you will note that most of my contributions to this thread will be of the matchy-matchy variety). It didn't work, but throwing the hidden flame fur AND flame whiskers, and getting the huck eyes, plus an ear that shows off the flame fur, was a really striking combination that I like but wouldn't have thought to try for on purpose. That's so cool, Shannon! Both of your unintentional results are fantastically pretty cats! It's great to see not one, but two old retired Balinese furs with those Huckleberry eyes on father and son. As new traits come out over time, the old ones get less and less common - it's a little glimpse of Kitty History to see them. (03-15-2019 05:32 PM)ShannonSpoonhunter Resident Wrote: This is an awesome thread. 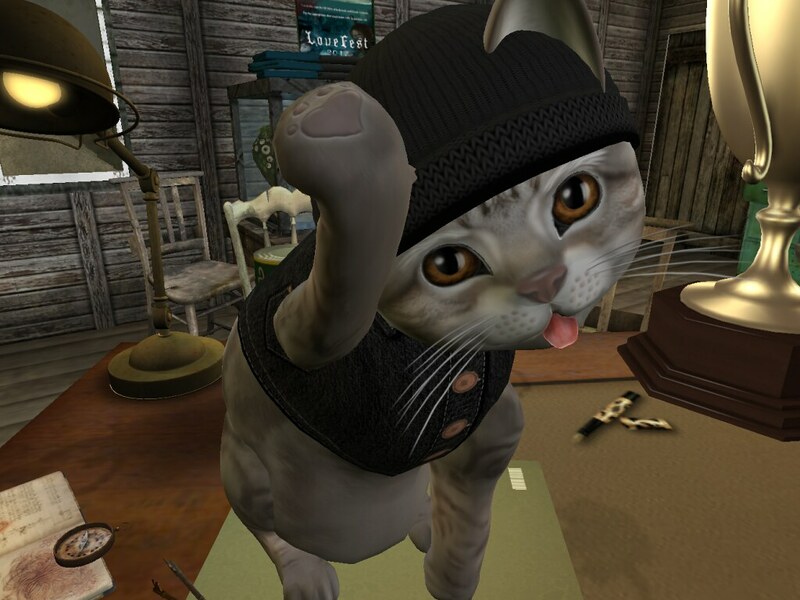 "Raise a paw if your kitty was recognized as an elder god by KittyCatS!"